This store is located within Belton Garden Centre, which is opposite the National Trust Belton House estate, just a few miles north of Grantham on the A607. The site has a large restaurant as well as all the usual facilities associated with a Garden Centre of this size. Our shop is within the main Garden Centre, on the left-hand side as you approach the outside plant section. The entrance to the store is flanked by our 2,000-litre L-shaped aquarium, currently home to an impressive pig-nosed turtle. 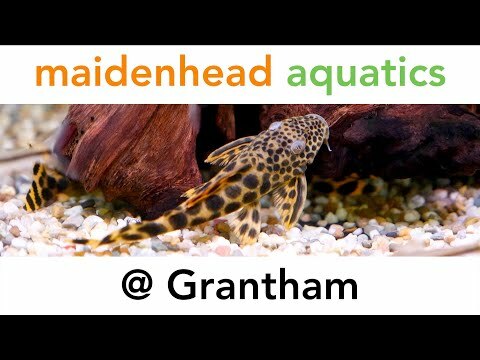 Inside we have over 100 aquariums offering a fantastic selection of quality tropical and coldwater species. With livestock deliveries arriving frequently, please phone for details of what is due in - our staff will be more than happy to try to meet any special requests. Alternatively, if you would like to check our current livestock availability, please call us directly on 01476 565 020. We take great pride in the quality of our aquarium plants and import some of the finest available from Holland. We have an 8-foot plant sales tank devoted to aquarium plants and we can hold over 300 potted plants with up to 45 varieties in stock at any one time. Please phone for current stock, as turnover can be frequent. Special orders are welcome and there are over 150 species available, so please ask. We also stock a wide selection of products for the water garden, from flexible liners at very competitive prices to quality pond plants and fish. We are stockists of some of the most advanced labour-saving pond filtration products available from leading brands such as Aquagarden, Blagdon, Oase and Hozelock. Our trained staff will be happy to demonstrate and help you select the best filter unit for your pond to guarantee clear water. There is a wide selection of dry goods and accessories for tropical and planted aquaria including a Co2 refill service. We can also cater dry goods for marine tanks (although we have no livestock in store). Our large indoor Koi pond is a focal point within the store and we welcome our customers to buy a pot of food for our resident koi “Big Bad Barry” and his friends. With regular special offers on aquariums and water gardening accessories as well as a helpful friendly service, we look forward to seeing you in store soon!